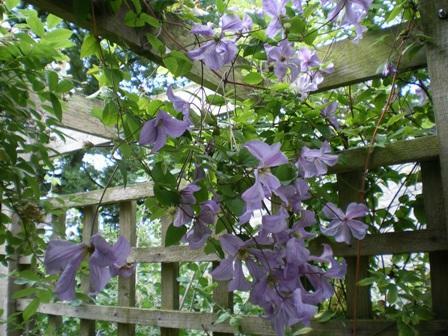 Would you like a pergola with a difference? 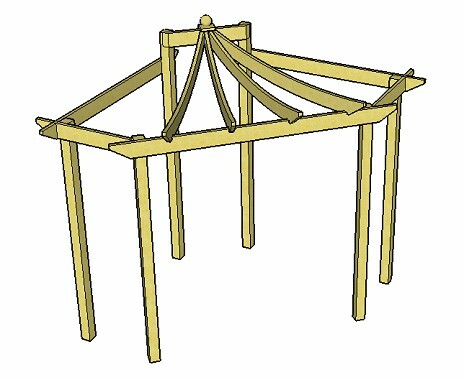 These Asian pergola plans create a structure with beautiful curved rafters, a feature typical of this style of pergola. Soak up the sun, and have a wonderfully relaxing time, with family and friends, under this stylish and unusual garden feature. Never picked up a drill before? No problem. The Asian pergola plans are intended for beginners, taking you step-by-step through each stage of the pergola construction. The plans come with detailed instructions, diagrams and pictures, including various ways in which the corner pergola plans can be adapted. Sometimes called dragon pergola, asian-style or oriental pergola designs, the plans are fully adaptable to any situation and come with 18 free rafter tail templates ready for you to use. The pergola building plans can be made to fit any length, depth and height you would like, to give a truly unique garden feature that you will be able to enjoy for years to come. Add planters, stunning climbing plants, garden furniture and wonderful oriental style accessories to make your asian pergola a truly unique outdoor space. In a secluded corner of the garden. Between two perpendicular house or garden walls. As a stand-alone feature, backed by colourful trees and shrubs. As a cover for a hot tub! On a patio, grass or decking. Add Asian style plants such as camelias, rhododendrons, acers, tiger lilies, crocosmia 'Lucifer', oriental poppies, magnolias, anemonies, bamboo and lemon grass to create a stunningly beautiful area. 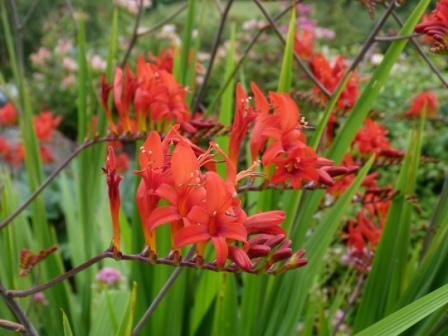 Crocosmia 'Lucifer' - stunningly exotic! Try using large, smooth bolders and pebbles, along with a small water feature, to enhance the overall effect. 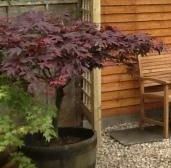 Acers, or Japanese maples - as they are more commonly called - give a really oriental feeling. Not only is their shape wonderful , with the flat planes of leaves - indicative of that part of the world - but what colours! Deep purples, oranges, reds, yellows, zingy lime greens and variegated. Simply gorgeous. Plant in a pot for smaller ones and in the ground for a full grown tree. The example footprint is 8' x 8', but the plans will work whatever the size of your area. The plans show how to extend the pergola. This is fully explained in 'Adapting The Plans'. 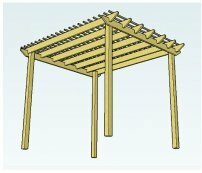 The pergola picture at the top of the page is drawn to scale, with a post size of 4", and rafters measuring 6" x 1.5", but again, the Asian pergola plans will show you how to use different sizes of timber to suit your own particular preference. Fancy rafter tails with a more decorative effect? Choose a rafter tail end template with curved ends and give a completely different feel to the pergola design, transforming your pergola into a truly unique garden feature. This pergola is really intended as a corner pergola design. However it could easily be built as a stand-alone garden feature. The curved rafters give it a truly oriental feel, and that is where the name dragon pergola originates. It is great for a themed garden construction. The Asian pergola plans show how to build the structure so that everything fits together seemlessly. With the notched rafters, there are no metal fixings showing. 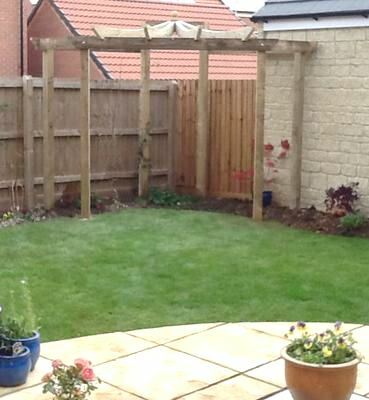 This pergola is sturdy, easy to contruct and looks absolutely amazing! 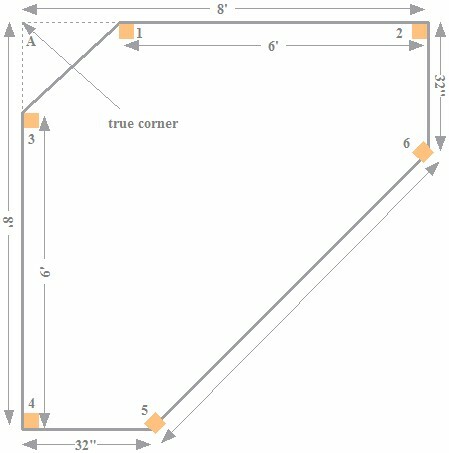 Can I really build this myself? Even though the finished pergola looks stunning, it is actually quite straightforward to build once you know what size fixings to use, where to cut the notches and how to create the curved rafters. Just follow the plans and you will have this wonderful pergola installed in no time at all. The beauty of building a pergola diy style is that you can modify it so that it exactly suits you taste, style and situation at a fraction of the cost for someone else to come and build it for you. Even if you buy a pergola kit, you will pay more, have less control over the design details, and will have to install it yourself. So if you feel confident, have a go. It's a great feeling, making a pergola from scratch. And the end result is well worth it! Usually I would say that you can use the principles outlined in the free pergola plans to build any pergola. However, this one is a little more involved because of the raised curved rafters, so it may be a good idea to have the plans, where you will get a step-by-step guide to building this wonderful decorative corner pergola. 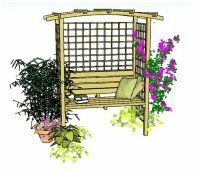 Because these plans were created as a bespoke pergola for visitors to the website, they form part of the 'Additional Pergola Plan Series' and so have a small charge. But if you would prefer to have a step-by-step guide to building this particular pergola, for the price of one of the rafters, you will have at hand detailed instructions on how to create an absolutely beautiful structure for your home and garden. Will These Plans Be Right For You? The Asian pergola plans are intended and written for beginners! If this is the first time you have tried a project like this, or your experience is limited, then they will make everything so much easier. They fit beautifully into an Asian, oriental or Japanese themed garden. They include a section on adapting the plans so that the pergola to fit your needs and particular situation. They will show you how to create the curved rafters. There are 18 different, ready to use, rafter tail templates, to make your pergola into a beautiful and unique structure. The finished pergola looks fantastic! 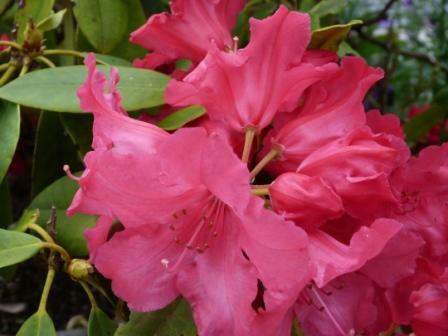 A gorgeous deep pink rhododendron gives an oriental feel. There are many ways to adapt the plans to fit your own preferences and needs. The plans still work with any of the modifications. Making your pergola longer or wider. Positioning the posts to give acceptable pergola beam spans. Making the rafter tails longer. 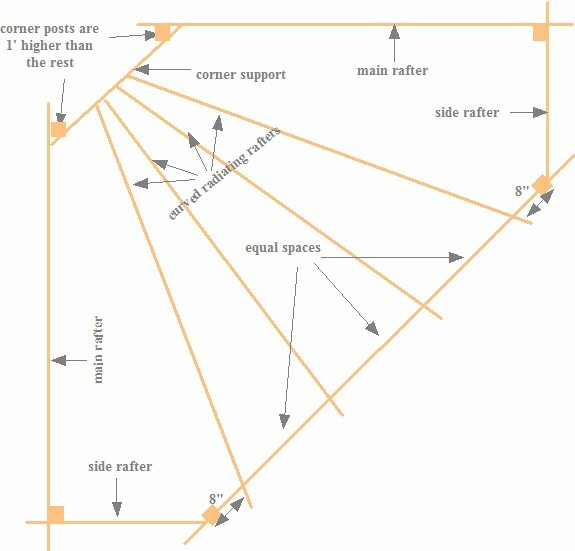 How to use flush-fitting rafters (sit at the same level as the supporting rafters), raised rafters (sit slightly higher than the supporting rafters) and un-notched rafters (sit fully on top of the supports) to give different decorative effects. 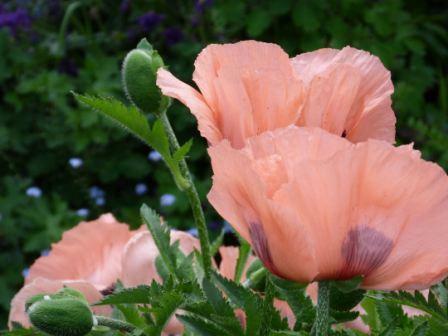 An oriental poppy - delicately beautiful. The plans are ready for immediate download, together with the 18 free rafter tail templates. If you can't find the download email for your plans in your inbox, please check your junk/spam folder. 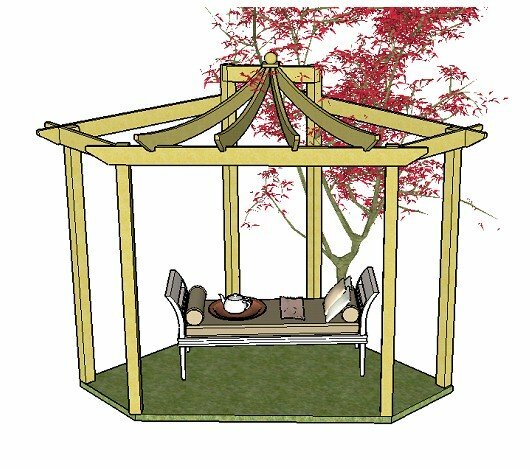 Click on the 'Add To Cart' button below, follow the simple instructions and your corner asian pergola plans will be with you straight away. Feel free to email me using the contact form with further questions you may have. 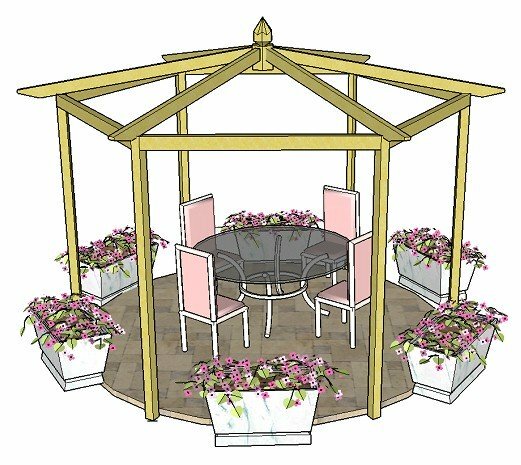 I hope you have as much fun building your asian pergola as I've had creating these plans for you. Give a whole new dimension to your outdoor living. Here's to your new Asian inspired pergola.